Before being diagnosed with terminal cancer, Sir Jason Winters led a full and extraordinary life. Whether traveling to exotic countries, embarking on courageous journeys on land, sea and air, or defying death as a Hollywood stuntman, Sir Jason’s life was nothing short of breathtaking. We have included a few bits and pieces of these amazing events below. It is the Canadian Centennial and Jason Winters was asked to do something spectacular to celebrate. The tall gangly boy had immigrated to Canada with his family and had been lumberjack in British Columbia. He and a friend decided to travel the Great McKenzie River; from the Great Slave Lake, sixteen hundred miles down to lnuvik, on the Arctic ocean. With canoe loaded, the two men pushed away from the dock, with the press and Indians cheering them along. It was a long, hard trip. Bitten by insects constantly the two men traveled in the absolute silence of the seventh largest river in the world. One day the canoe was badly damaged by a great north storm. Tremendous winds, torrential rains, the canoe was filling with water quickly They pulled ashore and lay soaking wet and exhausted, while the thousands of insects bit them incessantly. Three days they were stranded on this beach, many miles from civilization, with no roads or trails to follow Jason built a fire in a cave and the two men actually prepared to starve to death. An R.C.M.P. helicopter saw the smoke and landed on the beach. The pilot, who had been told to look out for the two men, strapped the canoe to the float of his helicopter and flew the two filthy and hungry men to a secret oil exploration camp. They were greeted like brothers, fed beans and steaks, then put to bed in a small hut to sleep for ten hours. Upon awakening, they found that the exploration people had completely repaired the canoe. Jason insisted on the helicopter returning them to the exact spot on the river that he had found them so they could resume and complete their trip. The newspapers were full of these stories as the two worked their way successfully down to the Arctic Ocean. 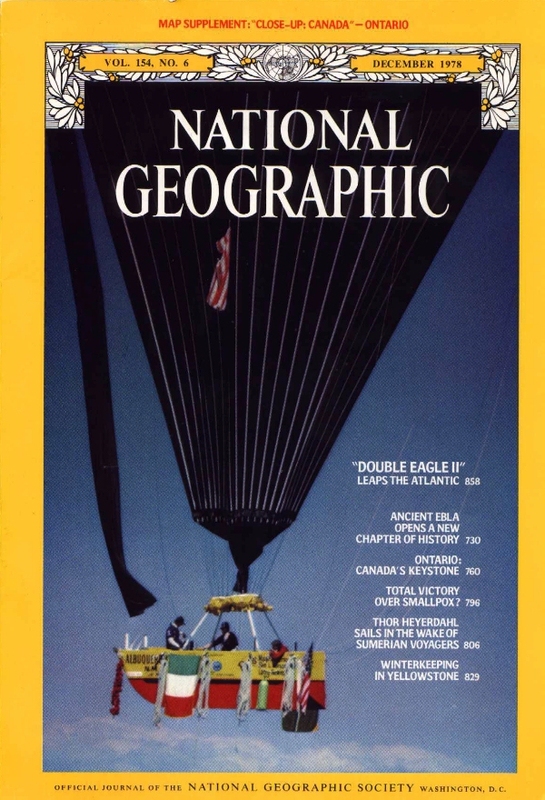 Jason had purchased a hot air balloon, called it “Oh Canada” and was training with the department of transport to obtain some kind of balloonist pilot license. This was difficult as no one had ever obtained such a license before. After weeks of perseverance, he at last received it. 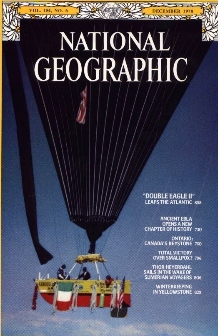 He was going to be the first man to fly across the Rockies by balloon. He soon found out why no one else had ever tried it. 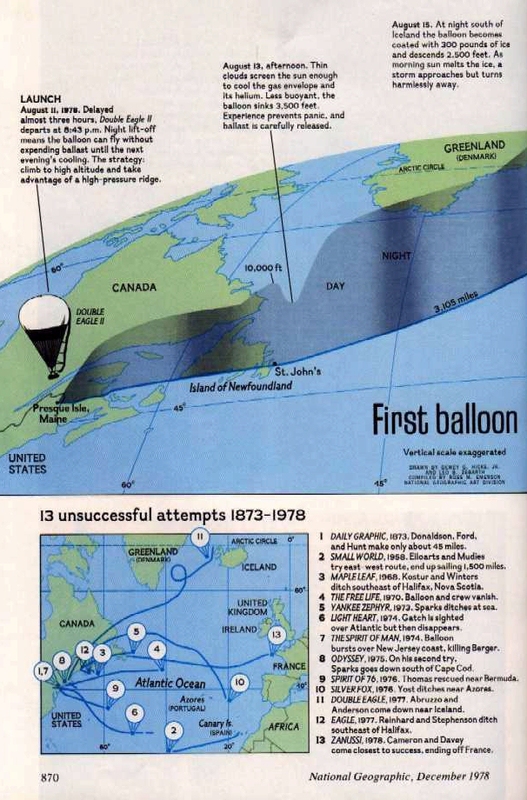 Updrafts would swirl the balloon up to fourteen thousand feet, then drop it down so low that the gondola was scraping the tops of the mountains. 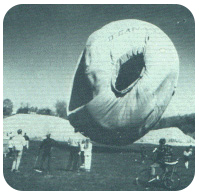 At eight thousand feet, the balloon was free falling when a freak wind turned the balloon into a sail. It crashed at a speed of thirty-miles-per-hour Knocked unconscious, he lay for at least an hour Then he started to walk out over the lush terrain. After three hours of walking,.. a jeep pulled up. The driver; Mr. Ralph Nichols, quickly took Jason to the hotel in High River where he was treated like royalty A local seamstress sewed the balloon and in two days time, he took off to finish the planned trip. as it appeared in People Magazine – Feb. 23 1972. With a helper; Jason placed the giant balloon into a trailer and drove across Ontario and on to Halifax, Nova Scotia. 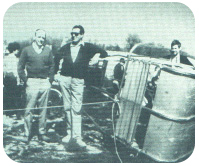 He had arranged for a large truckload of helium cylinders to be delivered to take off spot. Helium, being lighter than air, causes the balloon to rise. The take off day arrived. Thousands were there to see this spectacular event. The balloon was filled with helium, the wind was westerly, which was how it had to be. A nun rushed up to the boat that the two men were sitting in and pressed the holy cross into Jason’s hand. Then, amidst a thousand cheers, the balloon lifted skyward and was away. Jason had done away with the traditional gondola and had replaced it with a small sailing boat, a fact that was to save the lives of the two-man crew. Late that night, drifting along in complete silence and darkness they heard the sound of engines. A plane roared past them, circled, then shone a very bright searchlight on the balloon. They heard a voice over the loud speaker shout “Good luck, Jason,” then the plane disappeared. They were to find out later that the voice belonged to Prime Minister Trudeau. He had taken the time to fly out to wish them luck. Over the Marconi radio, the two men could keep in touch with the world, until, quite suddenly, they could hear violently crashing waves. Jason checked the altimeter and found that they were losing altitude rapidly. They had to lose weight. They threw over all kinds of equipment, but still lost altitude. At last they threw overboard the Marconi radio. This slowed down the decent, but they still crashed amid thirty foot swells. 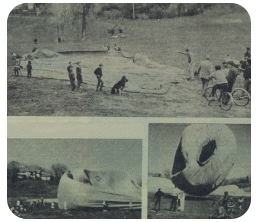 The balloon had to be cut lose quickly, otherwise the small boat would overturn. Jason watched the twenty-thousand-dollar balloon disappear across the sea. It now lies somewhere at the bottom of the Atlantic. Two days later; with no land in sight, and quite sea sick, an air-sea rescue plane spotted them when Jason raised the yellow sail to attract their attention. A fishing boat was dispatched to pick up the men. The mission had failed. But the two men survived. Dan Ross & Jason Winters say goodbye just before their journey. Dan Ross and Sir Jason during their trip on the McKenzie River. Sir Jason just prior to starting his 2800 mile canoe trip up the McKenzie River. 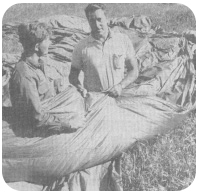 Sir Jason after crossing the Canadian Rocky Mountains by hot air balloon..
Rocky Mountain crossing – launching preparations. O’Canada, prior to Rocky Mountain crossing. This is a newspaper clipping of Sir Jason Winters in his balloon as journeyed across the Atlantic.